also to good value Romanian restaurants, bars and pubs in the Old Town. towel rentals and laundry facilities (extra). Bucharest, but away from the noisy sounds from the pubs. order to provide you with the best stay. what to see/do, where to relax/the best night-life is. Real nice stay ! 24h reception, nice staff ( Roxanaaaaa) and good location. Fine atmosphere and plenty of amenities. Real good ! Great place, really. Be aware that, if you are not fit, you will struggle to go up and down the 70+ stairs to get to/from the kitchen, as this three-floor building has no elevator. Extremely clean with plenty of toilets and showers in every floor. Very friendly staff and a very quiet place. Beds are very comfortable and they don't squeak. The only downside is that the kitchen facilities are very limited so you should always have ready-to-eat cheap food from the Carrefour supermarket nearby. AWESOME location and WONDERFUL staff. I stayed with my boyfriend at the beginning of January and we had the whole 6-people room for us only. The area is full of bars and nightlife. Very close greek restaurants too, with cheap food and typical music. So close to Monastiraki station, you can get anywhere from there!! Particularly convenient if you go from or to the airport. I'll stay there again next time I go to Athens for sure! Excellent place to sleep in the center of the city, beds are good, pillows are comfortable and everything is reachable via metro or busses from there Very good value for money Terrible security - I haven't received a key to store my belongings. Even tho I had only clothes, I wished not to leave everything on my bed at the mercy of every possible stranger. Location is great, but the hostel itself is a bit basic. You can't change beds easily, and the top bunks have no railings which seems a bit dangerous. Also if you are in a top bunk there is no way to access a power socket, annoyingly. 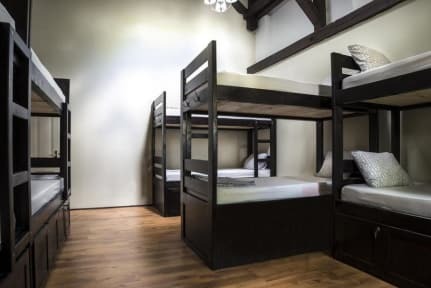 Weirdly the 8 bunk rooms are more comfortable than the 6 bunk rooms. There are a lot of stairs to climb, and the guy at reception seemed to be grumpy all the time and not very helpful. Great location and 24hrs reception so I could check out at 3AM. Full kitchen and laundry services with nice common areas. One member of staff checked me in (24th Feb AM) was SUPER friendly and lovely however the rest of the staff was not. Toilets were very dirty the first day but clean all the rest. Showers were ok. No room key or lockers. Absolutely no atmosphere and not a place to stay if you want to meet anyone or go out. Strange extra charges e.g. storing luggage and staying after check out. No vibe at all. Great location. They charge you to leave your luggage after 6pm, charge you to hang out with friends after you've checked out, charge charge. I booked the most expensive room, but since I wanted a bottom bunk they still charged me more. They could not give me a key to my room, had to beg to be let in room at 2am, then had to sleep with the door open because others didn't get a key card, either. Bizarre. I moved after a day, not my kind of place. BedBuds on the beds. I have exactly 11 bites. The pictures are showing lockers under the beds but they actually don't exist. The hostel was almost empty so the atmosphere was not nice. The only positive point is the location that is amazing. I don´t recomend and I would never return. (I was there between january 31st and feburary 3rd).